Angela Perkins sturggles to hear others, so her parents take her to the doctor for an examination. She must wear a hearing aid. Her friends think she is special and she enjoys wearing the hearing aid. 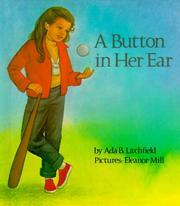 Litchfield, Ada B., “A button in her ear,” Children's Picture Book Database at Miami University, accessed April 18, 2019, https://dlp.lib.miamioh.edu/picturebook/items/show/6033.